Abstract Case study analysis and climatology studies are common approaches used in Atmospheric Science research. Research based on case studies involves a detailed description of specific weather events using data from different sources to characterize the physical processes responsible for a given event. Climatology-based research tends to focus on the representativeness of a given event by studying the characteristics and distribution of a large number of events. The current Earth Science data systems are not designed to assemble multi-instrument, multi mission datasets around specific events. In addition, such analyses typically require additional information from a variety of distributed resources such as storm and damage reports, images, and videos to provide complete contextual understanding. Consequently, it is both tedious and time consuming to manually gather relevant data and information from a wide variety of distributed resources for case studies and climatology analyses. 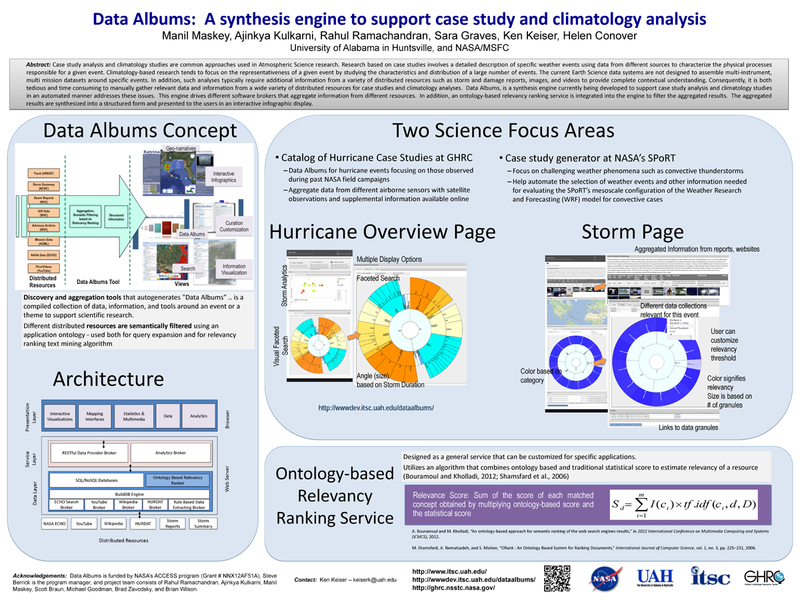 Data Albums, is a synthesis engine currently being developed to support case study analysis and climatology studies in an automated manner addresses these issues. This engine drives different software brokers that aggregate information from different resources. In addition, an ontology-based relevancy ranking service is integrated into the engine to filter the aggregated results. The aggregated results are synthesized into a structured form and presented to the users in an interactive infographic display.